This scene is probably the most famous part of I'll Say She Is. Harpo writes about it in the article My Brother Groucho in Coronet magazine, February, 1951: "Napoleon Scene is considered, within the family, to be the funniest we’ve ever done. Groucho, as Napoleon, is bidding farewell to Josephine. He is dressed in a tricorne hat, a frock coat bearing epaulets the size of cantaloupes, hip boots, and a sword that trips him with every step. He takes the lovely Josephine in his arms, and utters one of the theater's now-classic lines: Jo, your eyes are shining like the seat of a blue serge suit!" 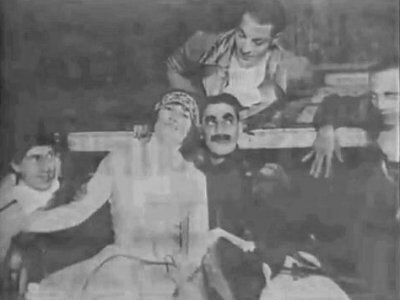 According to Simon Louvish' Monkey Business, the original scene featured only Napoleon and Josephine with Francois (Chico), Alphonse (Zeppo) and Gaston (Harpo) added in a later version. Alphonse and Gaston were originally comic strip characters created by the American cartoonist Frederick Burr Opper (1857-1937). They were two inordinately polite Frenchmen with the signature phrases "After you, my dear Gaston" and "After you, my dear Alphonse". As popular cultural icons of exaggerated politeness or deference, Alphonse and Gaston also found their way into vaudeville. It has been suggested that the Marx Brothers used the names of Alphonse and Gaston as a nod to the original characters. On this site, you can read three different versions of the Napoleon-scene. To compare the versions may be like watching three different performances of the show and experience the various ad-libs. But in spite of this, neither of these three versions includes Groucho's legendary and classic ad-lib "Ah, The Mayonnaise! The army (troops) must be dressing!" Version 1 is from the Library of Congress, stamped 10 November 1924 and unearthed in 2000 by Marxonian Peter Sprenkle. Version 2 is from Mad Mad Mad Comedians, a 30 minute cel animated special produced in 1970 by Rankin/Bass. The Marx Brothers' segment of the show is available in Real Audio (among several other items) on Frank Bland's Why A Duck-site, in the Streaming Audio Files section. Version 3 appeared in 1976 in the book The Groucho Phile by Groucho and Hector Arce and seems to be an extended version of the one in Mad Mad Mad Comedians. "The script for the sketch has been missing for thirty years. It miraculously turned up only recently - in one of my desk drawers", Groucho explains in the book. When The Cocoanuts, the follow-up to I'll Say She Is, premiered in 1925 the reviewers and the audience missed Napoleon. "Groucho was hampered by the absence of his burlesque of Napoleon", Percy Hammond wrote. 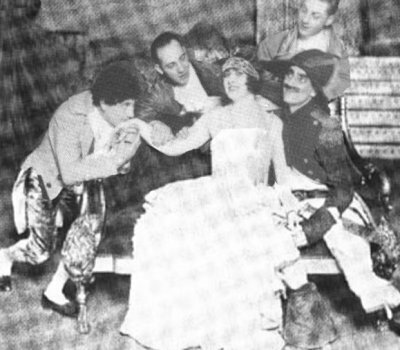 This led to the inclusion of "the Du Barry-scene" (a "play in the play") in the third show Animal Crackers in 1928. The war-sequence in Duck Soup (1933), with numerous changes of uniforms may be another reminiscence of the Napoleon-scene. Parts of its dialogue also popped up in later works by the Marxes. "Beyond the Alps lies more Alps, and the Lord 'Alps those that 'Alps themselves" in Horse Feathers from 1932 may be the most well-known example. The Marxes revived the sketch for personal stage appearances in New York (October 1930) and on tour (October 1931 - January 1932), variously retitled Napoleon's Return, Napoleon's Revenge and Schweinerei.